Marc Marquez has been crowned King of MotoGP once again. 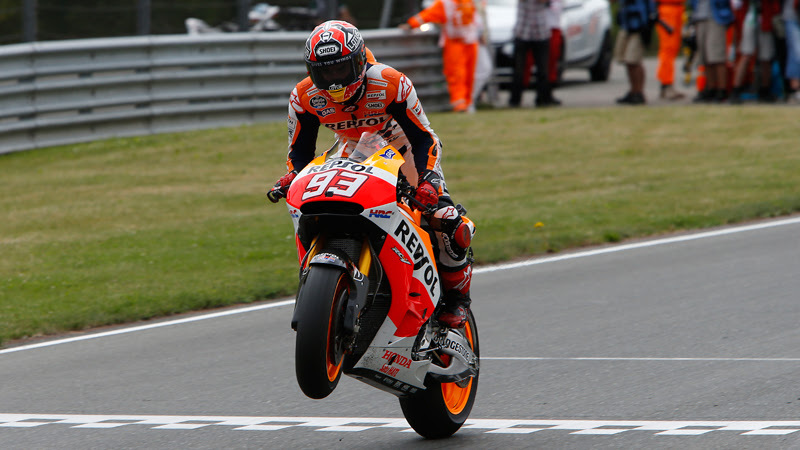 The Repsol Honda rider retained his title at the Japanese Grand Prix, achieving a new milestone. The Spaniard becomes the youngest rider in history to win two consecutive MotoGP World Championships, adding the accolade to his titles in 125cc (2010) and Moto2 (2012). 2014 is going to be hard to forget for Marc Marquez. The Repsol Honda team rider began the series in unstoppable fashion, stringing together ten consecutive wins and equalling the record set by Mick Doohan in 1997 –also as a Repsol rider. This season, Marquez has won 11 races and taken 12 podiums and 11 pole positions. The champion has been able to manage his advantage with a maverick style, en route to clinching the title in Japan. It is his second consecutive MotoGP title, making him the best rider currently in the premier class; it is also the third World Championship for him in three years after success in Moto2, and his fourth in five years, since he won his first title in the 125cc class aged 17. These figures have made him, at age 21, one of the most outstanding figures in the history of motorcycle racing. The Repsol Honda Team rider set a historic landmark and became the most successful rider in the history of this outdoor competition. The first place achieved today allowed Toni Bou to secure the World Championship title for the eighth time in the outdoor series. With this new success, the rider from Piera becomes the rider with the most titles in this sport, ahead of Dougie Lampkin and Jordi Tarres –both with 7 titles–. Bou secured this new title after showing great consistency, which allowed him to be the only rider that has not been out of the podium in the whole season. When adding these 8 outdoor titles to the 8 World Championships won by Bou indoor –X-Trial– the Repsol Honda Team rider gathers a total of 16 World Championship titles, all of them consecutive. Εκπληκτική εμφάνιση από το δίδυμο των οδηγών της Repsol στην Μαγιόρκα. Επάξια κατέκτησαν το 1-2 στον σημερινό αγώνα.